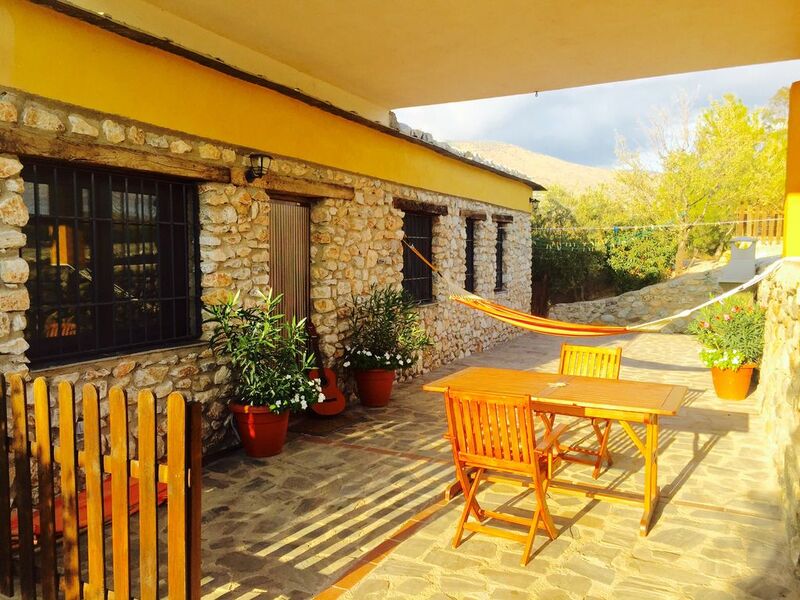 Stone cottage is in the outskirts of Orgiva, but just 2.5 kms to town, very peaceful and fresh area, it has two bedrooms and bathrooms, the best of it is the impressive views of the mountains from the pool or the porch. Detached, secluded and very peaceful. There is walking distance to a bus stop which is 5 minutes away and Orgiva is just 2.5 km away. A car is recommended to fully enjoy the area!. Well, I consider myself very positive and happy, the kind of person you like to have around! I am originaly from Spain and I lived in Orgiva for many years so I do know quite well the area!. One day 12 years ago decided to leave and go travelling, I have travelled to many countries in America, Asia and Europe but If I had to choose, I would probably choose France as the most appealing country and I would not mind living there for a while. I have lived in the UK, around 13 years in Ireland and also in NZ, I am back in this Special spot called Orgiva. It is small but very cosy! Very well built and with very thick walls to insulate it from the Cold and Heat. Its has two bathrooms and two bedrooms and a fire place!. Plenty of space all round, immerse in real nature and with an amazing views. Orientation is south east, south west so Sun makes you company all day long. Location is just the best, super easy access to Granada road, just 150 meter, 1.30hrs to Malaga airport, 45' to Granada city and 20 to the white villas. Sea side is 25' away so you can do mountains in the morning and beach in the afternoon as back for an evening swim in the pool. It's ideal for a young couple or people who look for peace since there is no house nearby but still very close to town. I have another properties and this is by far the best for an evening by the pool watching the stars. From the place you can do small trips to the interesting places around as Granada, Malaga or Córdoba, sea side is very close and Sierra Nevada national park is like 20 minutes away. Cycling, hiking, or rock climbing are the most practice activities around. Peaceful and into nature with such a great views. It has a lovely balance price-quality. The place is simple but you have all you might need for a nice stay. Tv, Wi-Fi, Pool and location. Para quien duda de gente joven o con animales, decir que fueron clientes ejemplares, educados, agradecidos ñ, limpios y ordenados. Les volvería a alojar una y mil veces. Air condition can be used with moderation, don’t leave it on if you are away, or with windows or doors open. I have an measured estimated consumption, if this goes way too high I would have to charge the extra electricity spent which is 1.5 Euros per KW. My personal suggestion is keep windows and doors closed during the day in summer time and open them in the late evening, like this you will get to have the house fresh and cool. Gas heater is always on and it works as soon as you open the tap. If you run out of gas, there is a spare bottle by the boiler which is on the down side of the house. Rubbish can be disposed in the bins by the main road, glass/ paper and can bins so you can do some recycling. We do the pool on Wednesday or Thursday morning and some gardening and watering is taking place on that evening as well, we try to do it as quickly as possible but we are around for a while. Pool isn't operative from November to March during winter months. There is no cleaning during the stay, unless you request it ( fee apply). Linen and towel change is only if your stay is longer than a week and then we arrange and provide, clean and fresh linen. Do not hesitate to contact me for any queries, concerns , issues, etc., I can do a lot more for you while you are here than when you are gone and you leave a bad Feedback. So LET us know what we can do for you during your stay, we can do a lot more then than when you are gone and leave a bad review! Let us know what you need and rate us high if we have done well Please.